My friends think I am loony tunes when it comes to what I grow in my garden. Some climb mountains, some jump from airplanes, and I grow unusual plants. I am a garden thrill seeker. This year, I grew buckwheat, sorghum, and artichokes in my northern garden. Buckwheat was the easiest plant to grow and an outstanding flowering plant. Yes, there will be posts about artichokes and sorghum. But now it is all about buckwheat! Isn’t the above picture of a buckwheat field to die for? I thought you would agree. Buckwheat likes to grow in cool weather but is not frost tolerant. It matures in about 12 weeks. I planted the last week in June since my nights would start cooling down the time that the plant would start to mature. For those who do not live in the north, see Jefferson Institutes’ article about growing buckwheat for commercial purposes. If you are a backyard grower like me, this article is very helpful. I ordered 1/4 pound of Buckwheat from Seeds of Change, but I made my plant plot too big. My plot was about 12 by 10 feet or 120 square feet. Buckwheat’s seeding rate is 50-100 lb./acre or 1.2 – 2.5 lb per 1000 sq. ft. According to the seed rate and if my math calculation were correct, I needed a little more than a 1/4 pound of seeds. I sprinkled my seeds over my weed free plot and pushed them into the soil, then put straw over the seeds. Note according to the Jefferson article, buckwheat is not a drought tolerant plant but more of a drought avoider plant, which means a hot dry summer will cause it to look limp and may stunt its growth. In a week, the little green leaves appear all over the plot. I was like a kid in a candy store. In 9 weeks, the plants will bloom with the most beautiful white flowers. Bees love buckwheat flowers, and many bee keepers grow it for the honey the bees produce. The plants were about 2 to 3 feet high and I hated snipping them because they were so beautiful with or without flowers. I waited until about 90-95% of the seeds turned dark. See picture above of my small field ready to harvest. Note, some harvest the seeds when 75% of the seeds are dark. I found it to be easier to de-seed the plant when almost all of the seeds are dark. Otherwise, I would have to be more careful and discard the flowers, leaves, and immature green seeds. Harvesting the plants using my method, I am sure many seeds fell to the ground waiting for me to harvest the plants. How do I know? A new crop cover is growing as I write this article. Harvesting the seeds was an absolute pain. I snipped the thin stems with scissors and tried several ways to get the seeds to fall off the stems to no avail. At the end, I start pulling the plants out of the soil. It is very easy. Why did I snip instead of yank? I thought if I snipped, the stems would just compost back into the soil, plus, I did not want the dirt all over me. Either way is fine. I took the lady- like approach. So, how did I get the buckwheat off the stems? First, I tried holding a bunch of stems and wacking them against a plastic bin. Nada. Second, I tried wacking the stems with a broom on a tarp. Nada again. Finally, I resorted to hand picking the buckwheat. See the harvesting buckwheat video above where Third Son demonstrates the art of stripping the seeds. It literally took me a week of mindless stripping of the seeds to obtain about a large bowl full of buckwheat. How did I do? Well, you are going to have to catch Part 2 of my Buckwheat Odyssey tomorrow. 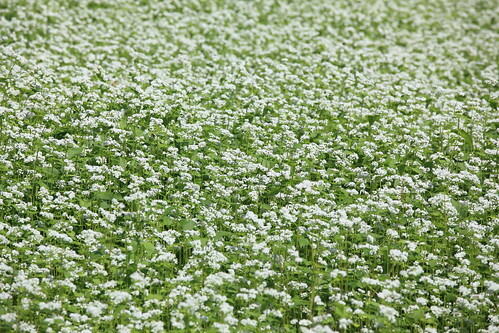 Photo of a field of buckwheat by TANAKA Juuyoh . I never took a picture of my buckwheat flowering. And just so you know, my plot is tiny compared to the above field of buckwheat! Thanks for the tips and the advices. I would like to ask one question about buckwheat. I have planted buckwheat at 4 June 2012,(50 m2) for colecting the seeds. Now (27 June 2012), after 24 days, it is 15 to 20 cm in height and has allready startted to flowering. Is this normal? Because i read in articles that buckwheat is growing to 70-80 cm. Thanks in advance. 80 cm = 2.6 feet. Further question on this thought. So are we saying here that buckwheat begins flowering way before it has reached its top height? and next thought is… Is that a little odd as plants go? I think most plants I observe grow to their top height and stop growing and put their energy into forming the flowers. So in their cycle of growth the begin to flower at a pretty early stage? Do I understand this correctly? They flower when they get at full height which is pretty small. I had never considered growing buckwheat because we don’t use it that often, but now I know where to go if I ever want to! There is a very old woman doing things the traditional way. Her traditional way is to cut many stalks and stand them up to dry them like the old fashioned method for drying wheat stalks. Now I don’t know very much about buckwheat and I don’t know if they are drying and using for instance the green stalks for a recipe or drink or what have you, but I wonder if cutting at 90% followed by storage and further drying may release the seeds better to the point that then hitting the stalks may cause the seeds to mostly fall off. The further drying possibly becoming a key element in the process so that the seeds are released easier. Okay so then possibly more standard threshing and then screening that so that only the seeds fall through the screen? 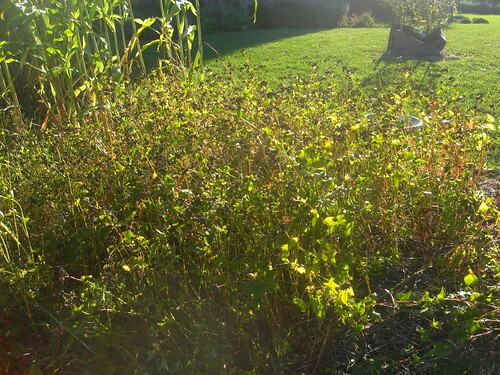 Extra leaves and stalks left behind on top of the screen (that you can toss back onto your buckwheat plot). I think throwing them into the compost pile would be a mistake here as they will likely sprout up everywhere that you use that compost during the next season. These are merely suppositions though. You could also look for articles on line concerning manual harvest of buckwheat. Remember this should be a crop that was grown in the south, before special harvesters existed. There are many articles on things like this written in older English. Another good source to look into for a better method would be the Amish and like cultures that still do most things in the simple way and by hand. Let me know if this helps or if you find anything. I would like to read up on the old fashioned method myself. I bet that would be easier. I just take the buckwheat off with my hands. The seeds are pretty large. I wonder what you could do with the stalks. I bet the leaves although small are edible.